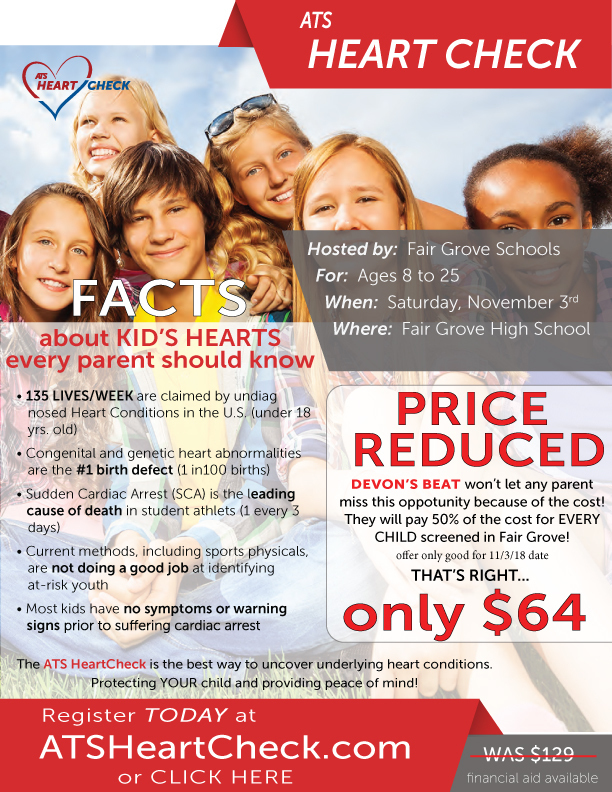 We want to remind you that ATS HeartCheck is coming to Fair Grove Schools on Nov. 3rd to provide comprehensive heart screenings for congenital and genetic conditions. The discounted price is typically $129 BUT DEVON’S BEAT, a non-profit foundation out of Lincoln, MO, has offered to pay 50% of the price for EVERY CHILD TESTED! Testing includes an EKG, blood pressure test and echocardiogram (heart ultrasound) for ONLY $64! The normal cost for these tests would exceed $1,500, if done in the hospital or doctor’s office. We strongly encourage you to take advantage of this opportunity and sign your child up for these potentially lifesaving tests TODAY. Appointments are offered on a First Come-First Serve basis and pre-registration is required by visiting the ATS HeartCheck website, or calling (913) 735-5760. Discounted pricing is available for those that qualify and can be requested on the ATS website as well.